We help Banks raise liabilities, bring new clients without the hassle of account opening at ZERO cost. We offer access to numerous, diversified distribution channels for high value deposits at no additional cost. Typically offshore private banks and wholesale banks offering Third-party savings products integrated into own offering. Direct client on-boarding with our nominated custodian bank. Large Clients include FI’s, Corporates and Family Offices. Different partners /brokers with own access to high value depositors. Third-party savings products integrated into own online/offline offerings. Complementary and at Zero Cost. Access Institutional and Corporate Deposits across the globe. Avoid cost of opening, maintaining accounts and KYC. Deal as Inter-bank deposits. Clients can pool in to make one large deposit. Help improve your LCR/AD/ NFSR ratios through quality, stable funding. Reduce operating costs of raising wholesale deposits. Wholesale Depositors - Corporates, FI’s, Family Offices, etc. Discover best available deposit rates and invest through one central account across the globe in a seamless manner. 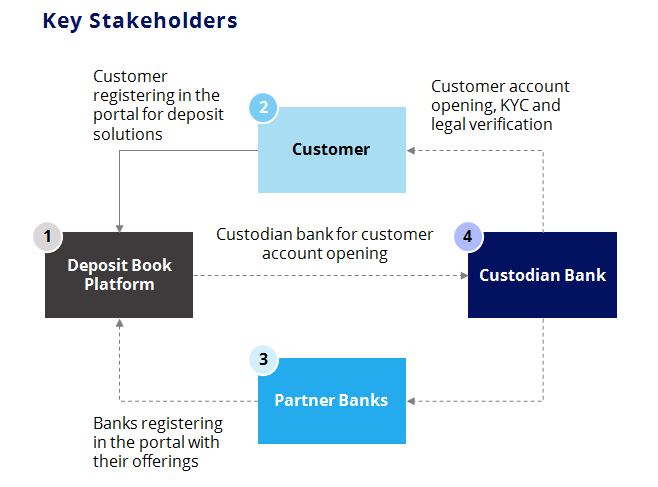 Client registers on the platform and opens a central account with a top rated custodian bank. This account will be used as a central conduit for all deposit flow. Client logs in and views the best rates available meeting their criteria. Once they find such a bank, they confirm the placement and then the platform will facilitate the placement process through a seamless, automated journey. Client can view transaction history, current deposits and risk/return analytics through the platform. Onboarding & Account opening hassles with multiple Banks. Ability to pool in special high value rates with smaller denominations. Inability to run RFQ’s for bespoke deposits. Efficient reverse query mechanism on getting bespoke rates from banks of your choice. Discover the Best Rate available in the market with exclusive special rates from time to time. Operate through one central custodian account for multiple bank deposits. Participate in special rate campaigns by pooling in deposits. White labeling our platform to provide third-party deposit products to your clients. Client Banks offer their customers attractive rates of 3rd party Partner Banks. Depositors can conveniently deposit their money with Partner Banks under the existing account relationship with their Client Bank. 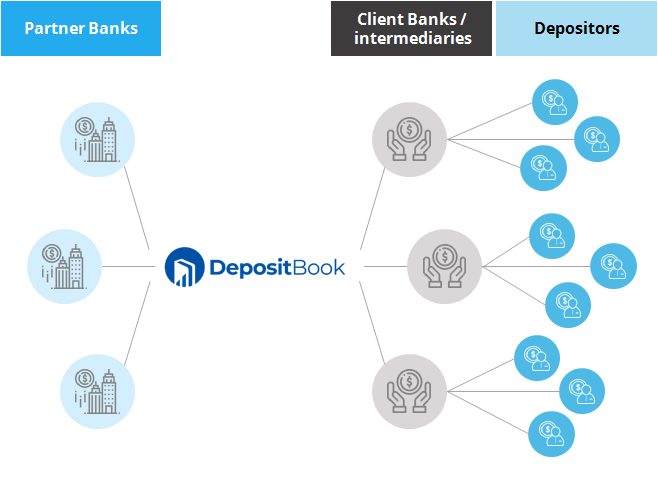 Partner Banks gain access to deposits from new customers.